It's further evidence that octopus intelligence is unlike anything we've ever seen. 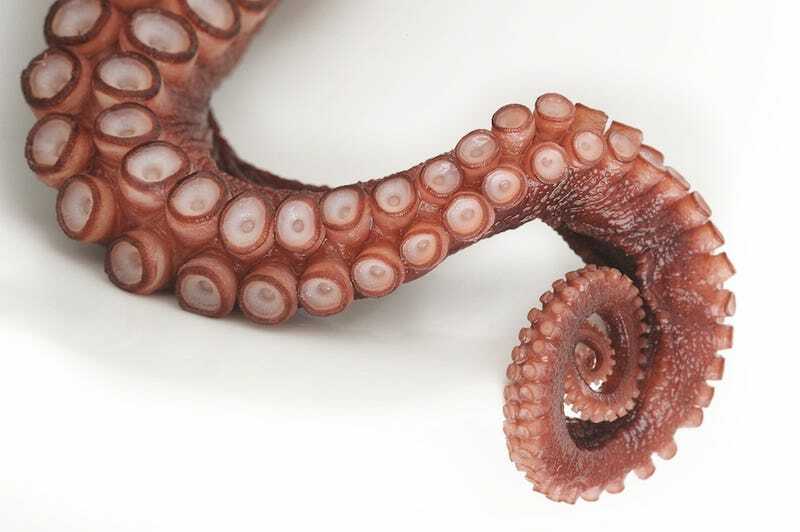 Their arms continue to remain alert, reacting to pain, long after they have been removed from the body of the octopus. This isn't just post-mortem twitching — the tentacles are aware of their environment, and responding to danger. After the animals were euthanized, their arms were removed and kept in chilled seawater for up to an hour until they were ready for experimentation. Some arms were suspended vertically, and others were laid out horizontally. When pinched, suspended arms recoiled from the unpleasant stimulus by shortening and curling in a corkscrew shape within one second. (After this, the arms slowly relaxed and returned to their previous length.) Tap water and acid applied to the arms evoked a similar response. Horizontal arms also moved away from the undesirable stimuli, many bending in a sort of contrived joint toward the top. “The results demonstrate that the arms are capable of reflex withdrawal to a ‘noxious’ stimulus without reference to the brain,” the researchers noted in their paper. You can read the scientific paper about the experiment in The Journal of Experimental Marine Biology and Ecology. Here's one image of how an octopus tentacle reacted to a petri dish with acid in it. You can see that the muscles in the limb bunch up, pulling it away from the perceived danger. The researchers believe this is evidence that the octopuses possess nociceptors, or neurons that specialize in reacting to physical danger. In humans, however, nociceptors are controlled by the spinal cord, and a severed arm wouldn't recoil from pain. Why would they continue to work in an octopus after the arms are no longer attached? No matter what the reason for the strange movement of the severed octopus arms, one thing is certain. This kind of scientific experiment probably won't happen again any time soon. Because there is so much evidence for octopus intelligence, the European Union has issued a directive stating that no experiments may be done on octopuses (and possibly other cephalopods like squid) that cause them unnecessary pain or distress. And I think we can all agree that having your arms severed and then tortured is therefore off the list.